Federal BBS information can be obtained at http://www.mbr-pwrc.usgs.gov/bbs/bbs.html by clicking on Trend Estimates and selecting the species in question. All estimates are for 1966-2005. *Note: There are important deficiencies with these data. These results may be compromised by small sample size, low relative abundance on survey route, imprecise trends, and/or missing data. Caution should be used when evaluating this trend. Breeding Range: New Brunswick and western Ontario southward to eastern Texas and Florida; also northern California to northern Baja California (Crocoll 1994). Breeding Habitat: Bottomland Hardwoods, Northern Hardwood, Hemlock Hardwood, large stands of contiguous, mature, closed canopy forests. Nest: Large stick nest, often with fresh conifer sprigs; 65 cm in diameter, usually built in a fork on the main trunk of a large hardwood. Nesting Dates: EGGS: mid-April to late May (Robbins 1991). Habitat use during Migration: Woodlands and woodland edges. Arrival Dates: Late February to mid-April. Departure Dates: Mid-August to mid-December. Winter Range: Rare winter resident in Wisconsin. Almost all individuals occur from southern Wisconsin north to Stevens Point and Green Bay. Most Wisconsin breeders winter from southern Illinois to Gulf states. Winter Habitat: The few individuals that winter in Wisconsin typically occur in woodland edges, fields, highway right-of ways, parks, and wooded rural, suburban and urban residential areas. Red-shouldered Hawks spend most of their time in mature forested landscapes associated with water. They prefer large stands of contiguous closed canopy, mature hardwoods or hardwood/conifer mix. The size of their breeding range varies depending on habitat quality. In Wisconsin two ranges within the Nicolet National Forest were 175 and 254 hectares (Jacobs and Jacobs 2002). Winter habitat is variable. The few that winter in Wisconsin usually do not remain on their breeding territory but utilize woodland edges, fields, highway right-of-ways, suburban parks, and wooded rural, suburban and urban residential areas (Jacobs and Jacobs 2002). Red-Shouldered Hawks use a wide variety of tree species for nesting. Out of 304 nests monitored in Wisconsin, Red-shouldered Hawks used red oaks most frequently (34%) followed by aspen (14%), American beech (11%), white birch (10%), sugar maple (8%), white oak (7%), and all other trees <3% each (including conifers). Nest tree heights averaged more than 24 m with a dbh >50 cm and a basal area of 27.5 to 34.2 m2/ha-1 (Jacobs and Jacobs 2002). Red-shouldered Hawks have a high nest re-occupancy rate and are typically very territorial and vocal around the nest site (Crocoll 1994). Most of Wisconsin’s Red-shouldered Hawk habitat had been altered by logging at the turn of the century and has not returned to suitable habitat. Currently, Red-shouldered Hawks are widely distributed in Wisconsin but in low numbers (Jacobs 2006). They most often occur in large tracts of forest lands, such as the Menominee Indian Reservation and Chequamegon-Nicolet National Forest. Red-shouldered Hawks also occur near major river systems and their tributaries in the central, northeastern and western part of the state, especially the Peshtigo, Oconto, Wolf, Wisconsin, Yellow, Chippewa, St. Croix and Mississippi rivers (Jacobs and Jacobs 2002, Jacobs 2006). The Red-shouldered Hawk was once one of the most common hawks in the eastern United States (Bent 1961), but now is reduced in the northern part of its range (The Nature Conservancy [TNC] 1999). It is listed as endangered, threatened, rare, or of special concern in 13 states. In 1979 it was placed on the Wisconsin Department of Natural Resources list of threatened species. Breeding Bird Survey (BBS) data suggest continuing declines of this hawk’s population in Wisconsin (Sauer et al. 2005). However, populations are now too low and localized to be adequately monitored by BBS methodology (Robbins et al. 1996). During the six-year period (1995-2000) of the Wisconsin Breeding Bird Atlas, observers recorded Red-shouldered Hawks in only 14% of the quads with breeding confirmed in just 6% (Jacobs 2006). Other censuses have found approximately 200-250 breeding pairs and 78 nest sites on the Nicolet National Forest (Jacobs and Jacobs 2002) and approximately 300 nesting pairs on the Menominee Reservation (Don Reiter, pers. comm.). Availability of nesting habitat appears to be the greatest limiting factor for Wisconsin’s breeding population. This area-sensitive species benefits from maintenance of large blocks of relatively undisturbed, mature mixed riparian woods and mature upland deciduous woods (with a preference for bottomlands and wooded margins adjacent to marshes) where at least 70% or more of the canopy is retained (WDNR 2005). Even-aged forest management practices, including oak management, typically do not encourage habitat suitable for nesting Red-shouldered Hawks. Selective cutting that reduces canopy closure below 70% or that divides forests into smaller woodlots may result in the replacement of Red-shouldered Hawks by Red-tailed Hawks (Bryant 1986). Conservation and management strategies for this species should be focused in the following Wisconsin ecological landscapes: Central Sand Hills, Central Sand Plains, Forest Transition, North Central Forest, Northern Lake Michigan Coastal, Southeastern Glacial Plains, and Western Coulee and Ridges (WDNR 2005). Retain stands of at least 8 ha around nest sites. Stands immediately adjacent (within a minimum of 91 m) to the designated territory will not be clearcut if practical silvicultural alternatives are available. Generally, no new roads will be built or existing ones reconstructed within the designated territory, or within 91 m of nests. Existing roads will be closed whenever possible. Where roads are built, seasonal restrictions will be imposed on their use. To the extent possible, human disturbance will be eliminated or reduced February 1 - August 1 (most critical period being April 1- May 15). The effects on raptor territories will be analyzed through the Integrated Resource Management implementation process. Future monitoring efforts in Wisconsin should focus on identifying suitable habitat statewide and conducting focused surveys using amplified conspecific callback methods or other survey techniques appropriate for this species. Other general research needs include quantifying impacts of forest fragmentation, determining the minimum size of forest tracts for successful nesting, assessing the effects of human disturbance on productivity, and monitoring the impacts of Red-tailed Hawks and other competitors (Hands et al. 1989, Crocoll 1994, TNC 1999, Jacobs and Jacobs 2002. Temple S.A., J.R. Cary, and R. Rolley. 1997. Wisconsin Birds: A Seasonal and Geographical Guide. Wisconsin Society of Ornithology and Wisconsin Department of Natural Resources, Madison, WI. Bent, A.C. 1961. Life histories of North American birds of prey. Vol. 1. Dover Publications, Inc. New York. Bryant, A.A. 1986. Influence of selective logging on Red-shouldered Hawks, Buteo lineatus, in Waterloo region, Ontario, 1953-1978. Canadian Field-Naturalist 100:520-525. Crocoll, S.T. 1994. Red-shouldered Hawk (Buteo lineatus). In The Birds of North America, No. 107 (A. Poole and F. Gill). The Academy of Natural Sciences, Philidelphia, PA and The American Ornithologists’ Union, Washington, D.C. Hands, H.M., R.D. Drobney, and M.R. Ryan. 1989. 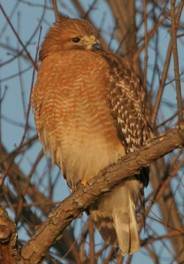 Status of the Red-shouldered Hawk in the north central United States. Missouri Cooperative Fish and Wildlife Research Unit Report. 21pp. Jacobs, J. 2006. Red-shouldered Hawk. In Atlas of the Breeding Birds of Wisconsin. (N.J. Cutright, B.R. Harriman, and R.W. Howe, eds.). The Wisconsin Society for Ornithology, Inc. 602pp. Jacobs, J.P. and E.A. Jacobs. 2002. Conservation assessment for Red-shouldered Hawk (Buteo lineatus) National Forests of north central states. USDA Forest Service Eastern Region, Milwaukee, WI. Robbins, S.D., JR. 1991. 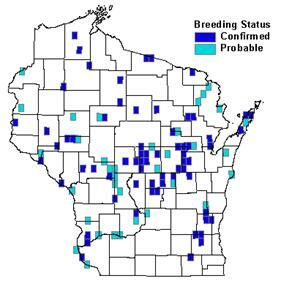 Wisconsin birdlife, population and distribution, past and present. University of Wisconsin Press, Madison, WI U.S.A.
Robbins, S.D., JR., D.W. Sample, P.W. Rasmussen, and M.J. Mossman. 1996. The breeding bird survey in Wisconsin: 1966-1991. The Passenger Pigeon 58: 81-179. Sauer, J.R., J.E. Hines, and J. Fallon. 2005. The North American Breeding Bird Survey, Results and Analysis 1966 - 2005. Version 6.2.2006. USGS Patuxent Wildlife ResearchCenter, Laurel, MD. The Nature Conservancy (TNC). 1999. Species management abstract: Red-shouldered Hawk (Buteo lineatus).